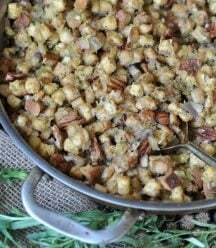 Vegan Pecan & Tarragon Thanksgiving Stuffing! 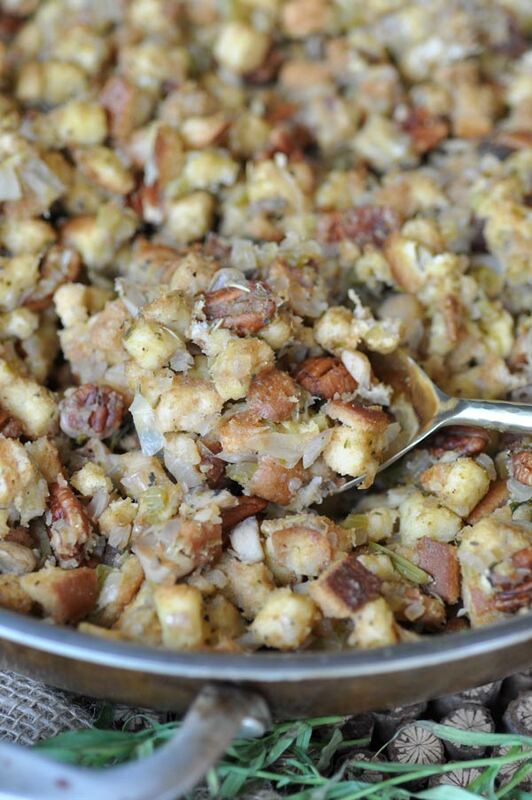 This pecan stuffing is a family recipe that we haven’t shared until now. We’re confident that you’re going to love it as much as we do. Stuffing (or dressing, depending on where you’re from) that’s shoveled into the carcass of a turkey, filled with sausage or (gasp) gizzards, or flavored with the juice of a bird is so pre-2017. Who does that anymore? Even when we did eat turkey for Thanksgiving we didn’t put it inside of the poor creature, and we didn’t add meat to it. Maybe our stuffing foreshadowed our future vegan lifestyle? Hmmm….. The Breakfast King invented this vegan stuffing way before we became vegans. It is, and always has been, one of our family’s favorite Thanksgiving sides, and for good reason. It’s freaking delicious! 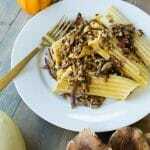 It’s filled with sautéed mushrooms, a Vidalia onion, shallots, celery, white wine, dried Italian seasoning, fresh tarragon, plain breadcrumbs, no-chicken broth, and sea salt and black pepper. The pièce de résistance is the spiced pecans. 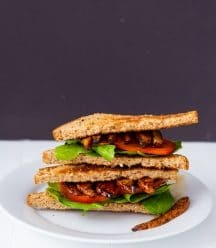 He toasts them in a cast-iron skillet with sea salt, black pepper, curry (if you don’t like curry you can add cumin or just leave it out), and a bit of cinnamon sugar. 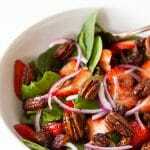 They’re savory and slightly sweet, and they add a fabulous crunch to the Thanksgiving dressing. The best thing about this traditional family stuffing recipe, aside from eating it, is the way it makes your kitchen smell. Heavenly. We all know how intoxicating the aroma of onions and celery can be, and when you add the wine for deglazing and the Italian seasoning and fresh tarragon, it rises to another level. Culinary perfume is what I like to call it. Making it from scratch is so easy. There’s no need to buy it. It only takes about an hour from start to finish, and you can make it a day or two before if you want to. Just cover it and heat it up in a warm oven until the center is hot. If it’s too dry after heating it, just add a little broth and put it back in the oven until it’s warm. First – Chop and dice the mushrooms, onion, and shallot, then sauté until slightly caramelized. Third – Add the breadcrumbs and toss to combine the mushroom and onion mixture. 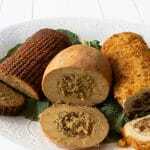 Fourth – Pour in the vegetable broth and fold the breadcrumbs until they’re uniformly moist and remove from the heat. Fifth – Toast the pecans with some sea salt, black pepper, curry, and cinnamon sugar. The fragrance from the spiced pecans is wonderful. Finally – Fold the pecans into the stuffing until evenly distributed and roast in the oven until the top is golden brown and crispy. Now that you know how to prepare Thanksgiving stuffing with spiced pecans and fresh herbs, let’s talk about how to store it, and what to serve it with. As I mentioned, you can make your dressing a day or two before if you like. Store it covered in the refrigerator until you’re ready to eat it. When you’re ready to heat it up, cover the pan with its lid or aluminum foil and place it in a 300°F (149°C) oven for approximately 20 minutes, or until heated through. If you want the top to be extra crispy you can put it under the broiler for a minute or two, just watch it carefully to avoid burning. 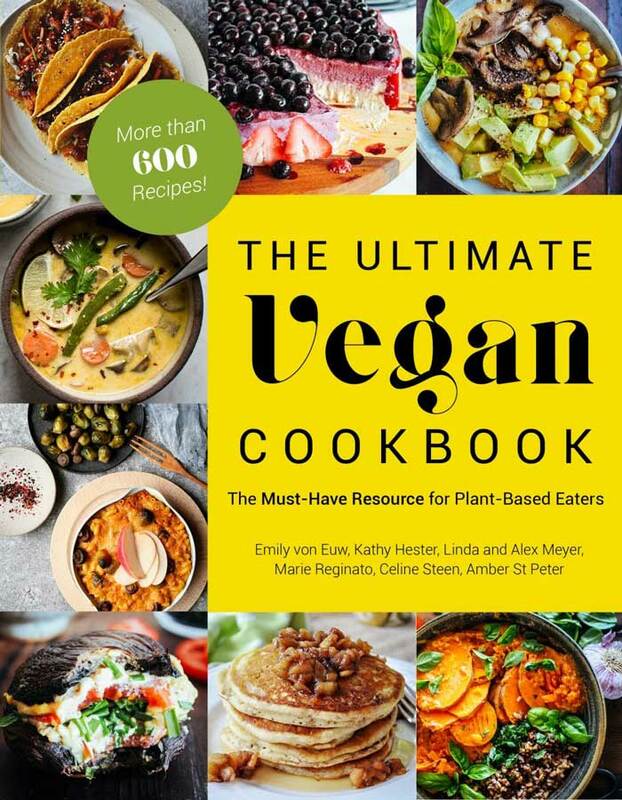 Holiday meals can be challenging for new vegans, and we’re here to help you. 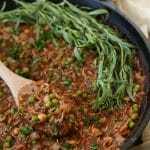 Take a look at our Vegan Holiday Meal Plans, click here. and here. 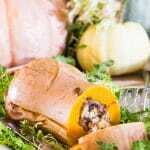 These will help you prepare a delicious Thanksgiving or Christmas dinner that your family and friends will love. 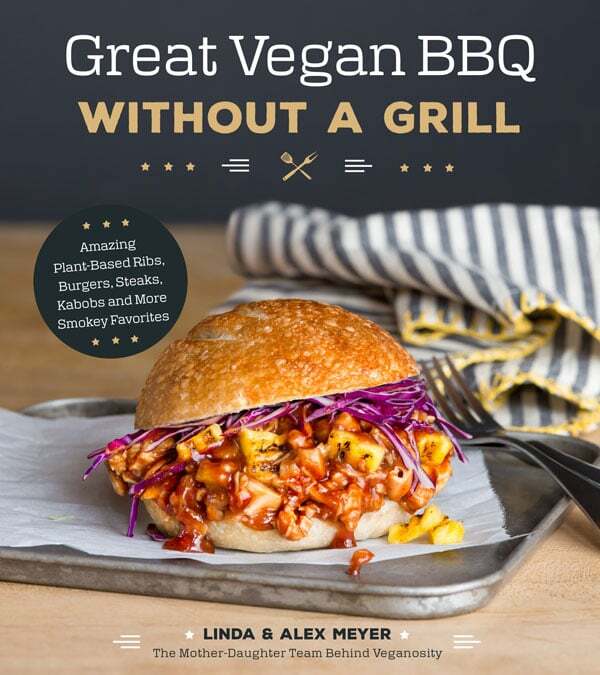 Yes, even your non-vegan friends will be impressed. 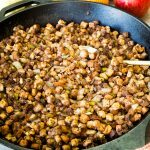 Make Greg’s aka The Breakfast King’s easy homemade vegan pecan stuffing for your next holiday meal, or just because you’re in the mood for some, then come back and let us know what you think. We love to hear from you. A savory and delicious homemade vegan stuffing with spiced pecans and fresh tarragon. 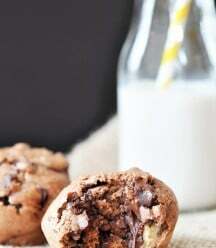 Easy to make! In a large skillet or Dutch oven, heat the olive oil on medium heat and add the mushrooms. Stir often and cook until they release their water and begin to brown. Approximately 5 to 7 minutes. Add the onion and celery. Stir often and cook for approximately 10 to 12 minutes or until the onion is lightly caramelized. Add the shallots, stir well, and cook for another 5 minutes. Deglaze the pan with the wine. Scrape the pan with a spatula to remove the stuck-on pieces of onion and shallot. Add the Italian seasoning, tarragon, and salt and pepper and stir to combine. Add the breadcrumbs and toss to combine with the mushroom and onion mixture. Now pour the broth over the breadcrumbs. Do this slowly and evenly to cover them. You don’t want to make one big pool of broth in the center. Fold the mixture until it’s uniformly moist. If it looks too dry add a little more broth, but not too much. The mixture shouldn’t be swimming in broth. Remove from the heat and set aside. Heat a small cast-iron skillet or non-stick pan on medium-high heat. When the pan is hot add the pecans and toss for approximately 2 minutes until fragrant. Sprinkle the salt, pepper and curry over them and keep tossing for another minute. Add the cinnamon sugar and stir continuously with a wooden spoon until it melts onto the nuts. As soon as the sugar is melted and the pecans are sticky, get them off of the heat so they don’t start smoking. If you don't want whole pecans in your stuffing, feel free to chop them. If you're not a fan of curry you can use cumin instead, or just leave it out. Yum!! I've never honestly made any stuffing before, but this looks really good! May have to try it this thanksgiving. Thank you, Anjali! It wouldn't be Thanksgiving in our house without it. Please let me know what you think if you try it. This looks perfect in EVERY WAY! This looks amazing, perfect comforting recipe for Thanksgiving. Thanks! This will become everyone's go to stuffing for decades to come. It looks good! That's so kind of you to say. Thank you Brandie! 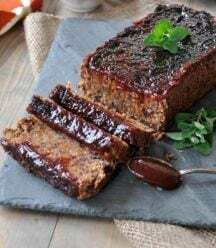 Our beautiful recipe, very well explained and I believe it is not difficult to do, I will take the risk in the kitchen now, thanks for sharing! Oh! This stuffing looks amazing! I wish I saw this before thanksgiving dinner! I am going to save this recipe for christmas dinner! Yes we are! Our dinner was on Monday! 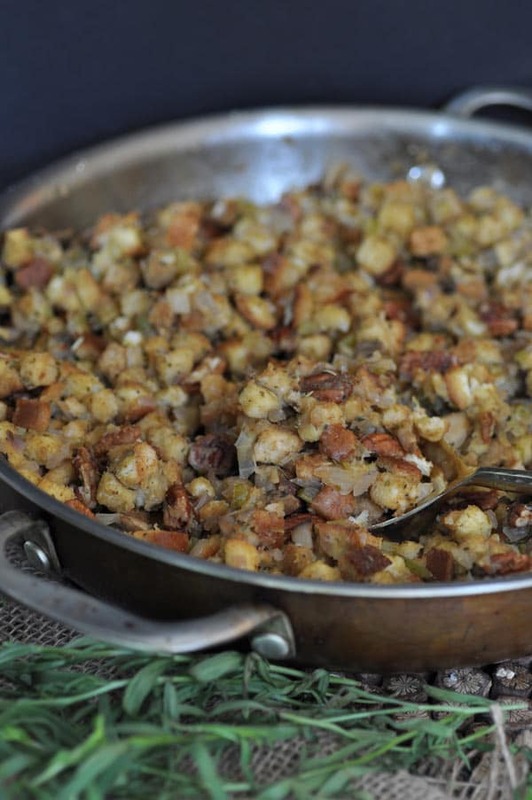 Stuffing is my FAVORITE thanksgiving side, this sounds incredible! This looks PERFECT for Thanksgiving. 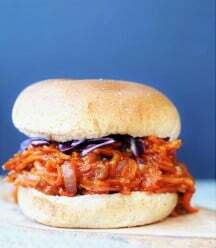 Adding this to the menu for this year! Hi Christina! 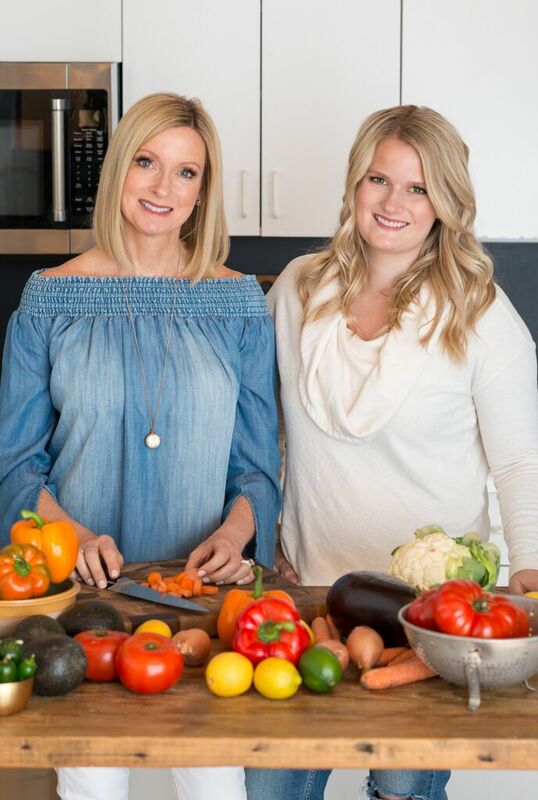 Thank you so much, I'm so happy you're planning on making more of our recipes. :) Most vegan breadcrumbs are vegan, especially the "plain" ones. I use Pepperidge Farms Unseasoned Cubed Stuffing to make this. It's basically cubed breadcrumbs. Larger cubed breadcrumbs make the texture of the stuffing so much better. Let me know if you have any questions. I may have overlooked it, however, would you tell me how may servings this recipe makes--thanks! Hi Simone! It serves 8-10, depending on how large the serving size is. Happy Thanksgiving! That’s perfect! Thanks for your reply—looking forward to making this next week!